Also known as huai shan (淮山) and shan yao (山药) in Chinese, the Chinese yam (Dioscorea opposita) is a root and has long been used as a Traditional Chinese Medicine (TCM) and foodstuff in China, to help digestion, relieve stomach pain, promote muscle growth and repair worn-out tissue, and alleviate bodily weakness after a long-term illness. The Chinese yam is known in TCM to travel along three meridians in the body – channels that supply qi (vital energy) – to the spleen, lungs and kidneys and replenish the qi in the three organs. Hence, it is used to treat symptoms of qi deficiency in them. TCM classifies Chinese yam as neutral and sweet. Chinese Yam is an important yin (moisture) tonic that is said to benefit the spirit, promote flesh development and when taken habitually, to brighten the intellect and help prolong life. It is also used by TCM practitioners to replenish qi and yin in the kidneys. It’s cooling nature helps control and regulates excess heat accumulations in the blood, spleen and stomach and helps moisturize internal dryness of the spleen and stomach. Now modern science is revealing that yams have even greater health benefits. Those who often consume “cold” foods such as ice cream and raw sushi are especially prone to qi deficiency in the spleen and will do well to consume Chinese yam. 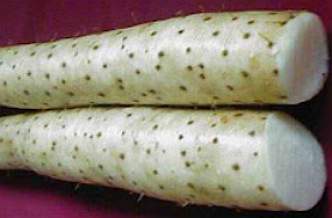 Chinese yam is a common food found in Japanese, Chinese and Korean cuisines. Dried Chinese yam looks like chalk. Chinese yam can also be found in its fresh form. To prepare fresh Chinese Yam for eating, simply wash and peel its skin and cut into cubes or slices for soup and cooking. Fresh Chinese yam is available in most Asian (Singapore, Malaysia, Japan, Taiwan, Hong Kong and etc) supermarkets.